Greetings fans of the outdoors and other Traction types! The sun is shining, the flowers are blooming, and spring fever is spreading like pine pollen. Well, friends, it is time to cure that spring fever with a special hike brought to you by Traction Outdoors! This Sunday join us for a strong dose of breathtaking river overlooks, deep-green rhododendron cliffs, and bright wildflowers as we hike through one of our area’s most unique ecosystems: Occoneechee Mountain State Natural Area. Get an extra dose of medicine by coming early for lunch at the picnic tables where we will chat with new and old friends and plan future Traction outdoors events. Even if you aren’t eating, feel free to come early for conversation — we’ll have drinks for you. The hike has some steep inclines and rocky areas over about two to three miles of moderately difficult trails (about 1.5 – 2 hours), so you will need to wear comfortable shoes. The forecast is for a mild, sunny 75 degrees at this point, but please bring water as you will get thirsty. You can find directions here. We’ll meet at the park’s picnic tables in the shaded area near the parking lot. Friendly, well-behaved dogs that love interesting smells and being on the leash are welcome. Jutting up over the Eno River near Hillsborough, Occoneechee Mountain is the highest point in the Triangle and one of the most unique places in the state. The park is home to a very diverse ecosystem, thanks to a topography that allows just enough changes in temperature to support flora and fauna common to both the NC Piedmont and the mountains. Along the trails, you will come across pines, laurels, blueberries, hollies, and a wide array of hardwoods — some familiar, some seemingly straight from your last trip to Asheville. The park is part of the Eno River State Park and is made up of former mill and quarry land. Start getting control of your spring fever now with a hike at Occoneechee Mountain. See you this Sunday! P.S. We would love to see you carpool with a friend or even ride your bike! If you let me know your home area when you RSVP, I’ll connect you with other Tractivists interested in carpooling. POSTPONED: The trip to the new civil rights museum in Greensboro. 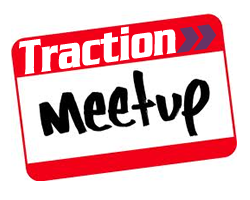 Write gbo@getTraction.org for more info.